In Beek, we produce suspension PVC (S-PVC) through a process of polymerisation. During this process, vinyl chloride monomer (VCM) is polymerised in the presence of water and additives. The polymerisation takes place in a series of reactors, distributed along 4 production lines. This set-up gives the Beek plant a high level of flexibility to produce a wide range of PVC grades, which are converted by our customers into a great variety of products for daily life. The VCM used in Beek is produced at the Vynova site in Tessenderlo (Belgium) and transported by pipeline to our plant. The Beek site is very well located with excellent access to logistic facilities and export markets. 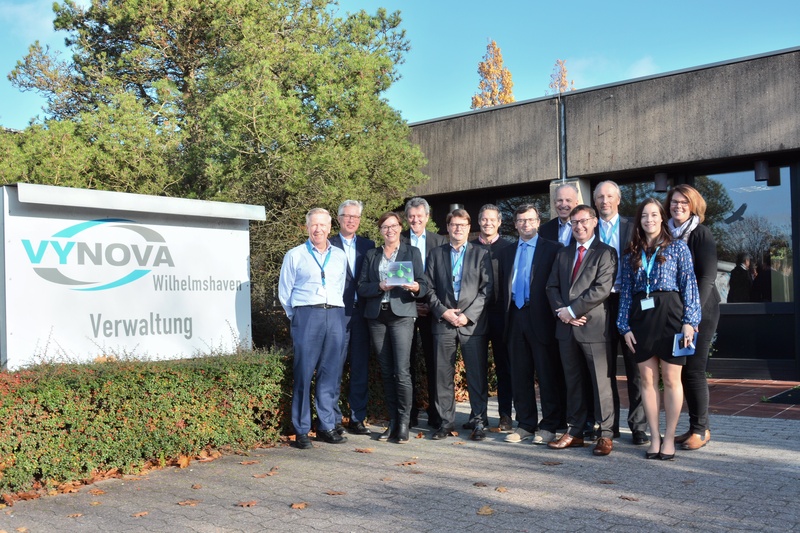 Vynova Beek is based at the Chemelot Industrial Park, a chemical innovation community housing dozens of companies. The Chemelot businesses are diverse, but all have one thing in common: they are part of the Chemelot community and behave accordingly. The community is open to the idea of continuous innovation in technology, products, applications, production processes, business models and organisation forms. This continuous improvement mindset is realised in cooperation with, and with the help of, other companies. The Chemelot community provides a wide range of facilities and services to Vynova Beek. These include a dedicated fire brigade and security services, along with Safety, Health and Environment (SHE) services. Chemelot also houses a biological wastewater treatment plant and on-site electrical power supply. As a responsible manufacturer, Vynova Beek is certified for the ISO 9001 quality management standards and the ISO 14001 standards for environmental management. The site is acquired by International Chemical Investors Group (ICIG). Vynova is founded. The new company comprises the Beek site as well as sites in Tessenderlo (Belgium), Wilhelmshaven (Germany), Mazingarbe (France), Runcorn (UK) and an affiliated site of ICIG in Thann (France). The PVC activities of Tessenderlo Chemie, including the Beek plant, are sold to INEOS ChlorVinyls. DSM sells its stake in Limburgse Vinyl Maatschappij, including the Beek PVC plant and the Tessenderlo VCM plant, to Tessenderlo Chemie. Limburgse Vinyl Maatschappij produces its first batch of PVC in Beek. DSM and the Belgian firm Produits Chimiques de Tessenderlo found the joint venture Limburgse Vinyl Maatschappij to produce vinyl chloride monomer (VCM) in Tessenderlo. The Dutch firm DSM starts with the large-scale production of nitrogen fertilizer on the premises of the current Chemelot Industrial Park. Discover the latest news from our Beek site via the button below. Vynova Beek operates with respect towards the environment and with consideration towards the health of our employees and communities by implementing safe manufacturing processes. Our commitment to quality, safety and environmental accountability is summed up in the Vynova Safety, Health, Environment and Quality (SHEQ) policy, which you can consult on the dedicated page. Specific safety-related documents and procedures at Vynova Beek are available on the Regulations pages of the Chemelot website. Are you a contractor or supplier for Vynova Beek? Here you will find useful documents and guidelines. Also, please regard the safety-related documentation included in our Safety, Health, Environment and Quality (SHEQ) section above. At Vynova Beek, we value the commitment of our employees and the vital role they play in our success. We invite you to discover the different job opportunities at our site via the button below. If there are no vacancies published at the moment, you can submit a spontaneous application. DO YOU HAVE ANY QUESTIONS ABOUT VYNOVA BEEK?